Sally Merryman has taught middle school Spanish in North Carolina for more than 20 years. She, like thousands of teachers from all over the state, plans to march on the state capitol in Raleigh this week. "I think a lot of us started to see, 'well shoot, if West Virginia can do it, North Carolina can do it,' " she told NPR's Ari Shapiro. "If Oklahoma can do it, North Carolina can do it. If Arizona can do it, so can North Carolina." On Wednesday, teachers in North Carolina will become the latest to leave their classroom posts and march on their state capitol, wearing #RedforEd T-shirts, in a quest for better compensation for themselves and more resources for their students. "That energy spreads like wildfire," says Merryman, "because people really feel now that there's some momentum in this movement and they can really affect change." Seamus Kenney, a middle school band and chorus teacher from Chapel Hill, will be there. So will his wife, Kerri Lockwood, who teaches elementary school art. Kenney comes from a family of teachers, he told NPR. Falling wages have driven some of his colleagues out of the profession, but others, like himself, are "hunkering down and saying, 'No, I'm staying,' and demanding that it be improved." Kenney says he moonlights giving private music lessons to make ends meet, sometimes working 13-hour days with choir and band concerts. "I'm not asking for everything all at once, but I do want to look down the road and feel that I'm progressing towards a better life," he adds. Tim Moore, a Republican who is the state's Speaker of the House, says North Carolina is already showing progress. "The [National Education Association] just ranked us last year as the No. 1 state in the country for teacher wage growth," Moore says. "Teachers are getting bigger pay increases than any other state employees." He sees "a liberal political agenda" behind the protests. This is the sixth statewide teacher protest since February. 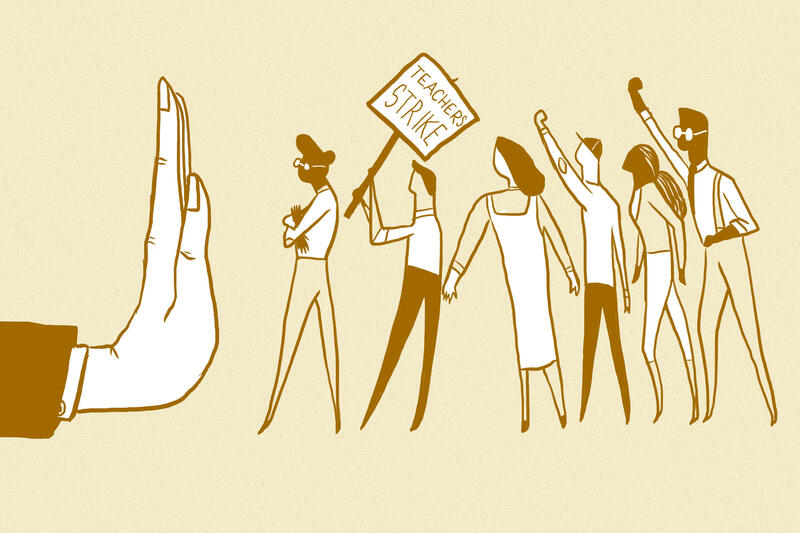 With the broad support of parents and other members of the public, teachers, through grassroots organizing, have notched some victories in a group of mostly Republican right-to-work states. Agustina Paglayan is a political economist who studies how governments around the world choose education policies. She says teacher pay has been comparatively low in the protesting states at least as far back as the 1930s. And, Paglayan adds, she has the answer to an apparent mystery: Why have these statewide uprisings have taken place in places where unions are historically weak? Paglayan's research says you have to go back to the 1960s to understand. "Before then, less than 5 percent of teachers belonged to a union," she explains. "It was not an organized profession." In the midst of civil rights, feminist and anti-Vietnam protests, there were hundreds of public sector worker strikes per year between 1966 and 1968, Paglayan says. On the picket lines, teachers at times won better pay packages and more respect. But in 19 states including New Jersey and New York, in exchange for collective bargaining agreements, they also accepted severe penalties for striking — like losing two days of pay for every day they were out, or even having their union dissolved. So why are teachers marching now in places where unions are weak? Simple, says Paglayan. "They have much less to lose." Without strong union structures in place, educators are winning concessions through grassroots and online organizing. This, Paglayan says, is a fascinating development considering the case now before the Supreme Court that would hobble the power of unions to collect any fees from nonmembers. "If they rule something like that, that starts taking away some of the benefits teachers got in the 1960s, you could end up having a wave of strikes in a lot more states." Jane McAlevey is an organizer and labor scholar who pretty much predicted what's going on right now. She published a book in 2016, No Shortcuts, arguing that in reaction to decades of tax cuts and budget cuts, "education and healthcare workers will create a woman-led new labor union movement." One of the book's case studies is the Chicago teacher strike in 2012, which she argues is the forerunner to this year's protests. She also points to the defeat of a ballot question on charter school expansion in Massachusetts in 2016 as a major recent teacher union victory. And she says the "Bernie Sanders effect" in states like West Virginia, which handed him a primary victory in every county, laid the groundwork for the populist economic message that is resonating now. Michael Hansen, a political economist at the Brookings Institution, also gets points for prescience. He wrote a blog post on April 13 naming North Carolina as one of the possible states at risk for teacher action. His criteria were: low-ranking salaries, salaries and per-pupil funding that's fallen in real terms since the Great Recession, and teacher pay determined at the state rather than district level, which makes state capitals the obvious target for an action. The other states on Hansen's list, if you're curious, included Mississippi, Alabama, Georgia, Idaho, New Mexico, South Carolina, South Dakota and Utah. Hansen sees a "domino effect" in progress, helped along by some political "tailwinds": "the Democratic midterm wave elections, the women's #MeToo movement. There are just a lot of big movements happening here." As he points out, women are a common thread in many of these movements. The partisan gap by gender — blue for women, red for men — is as wide as it's ever been. A record number of women are running for office this fall. And teaching is among the most female-dominated professions. A wave of blue candidates? So it's not too surprising that many teachers coming off their labor actions have been inspired to become candidates for office. Renee Jerden, a choir teacher, just filed to run for state senate as a Democrat in Norman, Okla. She calls the walkout "the last straw," in her decision to run for office herself. Besides education, she says, "my platform is, how is this issue going to affect the kids of Oklahoma? Poverty, health care, taxes." She says she's never seen her colleagues more engaged. "The longer we see all these other states start to have the same similar movement, we realize we are waking up a sleeping giant and filling it with a terrible resolve." Jennifer Samuels teaches middle school in the Phoenix area, and just filed papers to run for the Arizona statehouse as a Democrat as well. She had originally planned to run in 2020, but after #Red4ED, "I had a front row seat in the gallery overnight to watch the debate, and watching our lawmakers really have no interest in appropriately funding public education." Education and health care workers, McAlevey says, have an advantage over the factory workers of previous generations when it comes to building a broader political and social movement. "They're mission-driven workers. They have an incredible relationship with the broader community. People love their teachers and nurses for good reason. They fight harder because they're not fighting for a raise, they're fighting over whether we're going to have public education." But the most fundamental motivation here, says McAlevey, is as simple as a pendulum swing. "Everyone is just done with having no money. There's nowhere to go but up." Melissa Easley, a seventh-grade science teacher in Charlotte, echoes these words. "The legislature has asked us to do more with less. We are at our max, we can't do anymore." Easley says she was wearing her Red for Ed T-shirt last week at the grocery store. "I was stopped by four different people: Are you going to Raleigh? Yes. Good for you." It started in February with West Virginia. UNIDENTIFIED CROWD: (Chanting) Sign it, sign it, sign it, sign it, sign it. SHAPIRO: As winter turned to spring, teacher protests moved to Oklahoma, Kentucky, Arizona and Colorado. UNIDENTIFIED CROWD: (Shouting) You made me use my teacher voice. UNIDENTIFIED PERSON: (Shouting) You left me no choice. SHAPIRO: Tomorrow, the action moves to North Carolina. Thousands of teachers from all over the state plan to march on the Capitol building in Raleigh. The biggest districts have canceled classes for the day. Sally Merryman has taught middle school Spanish in North Carolina for more than 20 years. SALLY MERRYMAN: I think a lot of us started to see, well, shoot, if West Virginia can do it, North Carolina can do it. If Oklahoma can do it, North Carolina can do it. If Arizona can do it, so can North Carolina. SHAPIRO: What I hear in your voice sounds like frustration transforming into a level of excitement and hope that maybe you haven't felt in a while. MERRYMAN: Oh, yeah. Oh, yeah. It spreads like wildfire. That energy spreads like wildfire because people really feel now that there's some momentum in this movement, and they can really affect change. SHAPIRO: I went to the Raleigh area to watch this protest energy spreading. I spoke with teachers and a lawmaker about why these tensions are bubbling over now and what's likely to come of them. SEAMUS KENNEY: Also, fair warning, we have a pet hedgehog. SHAPIRO: Mona the Hedgehog is technically a classroom pet. Right now, this little bundle of spikes is at the home of Seamus Kenney and Kerri Lockwood. They're married and pregnant with their first child. He teaches middle school music. She teaches elementary school art. The kids named Mona the Hedgehog after the "Mona Lisa." KERRI LOCKWOOD: My students with, like, more severe behavioral problems, it's really easy for them to bond with an animal. She found a grant to buy the hedgehog. Kerri and Seamus get creative to make ends meet. The hedgehog's glass cage sits in a spare room of the house that they plan to rent out for some extra income. Both of them work multiple jobs. She does graphic design on the side. LOCKWOOD: I always kind of knew that I was going to have to be frugal, and I'm OK with that. But I really value my time, so I didn't have the expectation that I was going to have to work more than one job. SHAPIRO: North Carolina ranks 39th in the country for teacher salaries, according to 2017 data from the National Education Association. Kerri and Seamus would make more money teaching in the towns where they grew up. Kerri's from northern Indiana. Seamus is from rural upstate New York, and his old hometown music teacher is about to retire. KENNEY: I don't know if I'd be up for it. It's high school. I teach middle school. But it would almost double my salary just by moving there. SHAPIRO: That temptation is one reason North Carolina has a teacher shortage of thousands of educators across the state. SHAPIRO: Seamus let us shadow him for a day. He arrives at school before 8 a.m. and his first class is seventh grade chorus. UNIDENTIFIED STUDENTS: (Singing) Elijah Rock, shout, shout, Elijah Rock, coming up, Lord. KENNEY: Now, I teach a private piano lesson. This is a family I've worked with for about two years. KENNEY: (Laughter) Cool. Now, we just have to put it all together. SHAPIRO: ...Then back to school for a band concert in the evening. KENNEY: And then, of course, there's chatting with parents afterwards, so we're looking a good 14-hour day today. SHAPIRO: His salary is about $45,000. That's for a teacher who's been working seven years in one of the best-paying districts in the state. Back at their house, I asked Seamus and Kerri if they can sustain this lifestyle. LOCKWOOD: Yeah. I don't really know how to answer that. It's going to be challenging when we have a child, and we have new expenses. So I just don't know how it's going to be. SHAPIRO: In each state where teachers have protested, the demands have been different. The focus might be pensions, teacher salaries or school buildings. North Carolina teachers have a range of demands, but their central argument is that the state's education spending never caught up after the Great Recession. So pay is one big complaint. Another is the amount of money every school gets for its students. Buildings need repairs. Classes are crowded. CARLOS PEREZ: Most of my classes - I think 3 out of the 4 have over 30 students in them. SHAPIRO: Carlos Perez teaches high school social studies. PEREZ: You can also see the state of the floors - the cracks, the crumbling tiles. SHAPIRO: From a creaky old cabinet, Carlos pulls out the textbook for a class called Law and Justice. From Supreme Court justices to major legal developments, the textbook has a lot of information that's out of date. It's from 2005. So I'm curious, does this textbook refer to Senator Barack Obama? PEREZ: Yeah. It would refer to Senator Barack Obama. It also, you know, wouldn't include marriage equality. It wouldn't include a lot of significant legislation that's gone through in the last 10 years plus. SHAPIRO: So as a textbook, it's limited in its usefulness. PEREZ: Oh, undoubtedly. Yeah. I mean, mostly they stay in there. SHAPIRO: Like thousands of others, Perez plans to march in Raleigh tomorrow. PEREZ: I think it's a sort of responding to the decline in conditions that we've all seen, felt, witnessed, and people have just reached a boiling point, particularly in the South but really around the country. And more and more people are tired of taking blow after blow after blow. And I think folks are finally starting to look around and say no one's coming to save us. We need to save ourselves. SHAPIRO: Tomorrow's protest is timed for the first day of the legislative session where Republican state lawmaker Tim Moore will preside as speaker of the House. He says the state is already addressing some of the teachers' concerns. TIM MOORE: We're moving things up. I think the NEA just ranked us last year as the No. 1 state in the country for teacher wage growth. And this year, we've been ranked No. 2, so we're on a sharp trajectory. And I can tell you that teachers are getting bigger pay increases than any other state employees. SHAPIRO: That being the case, why do you think thousands of teachers are coming to march here on Wednesday? MOORE: I'm scratching my head over that because if you look at what we've done - five years of consistent pay increases - my belief from what I've seen is if you look at some of the folks organizing this is that they're getting rank-and-file teachers to come in on it. But the folks organizing it tend to have more of a liberal political agenda. And so I think that's a big partisan part of it. And that's why, frankly, a lot of teachers that I know have said on Wednesday they're going to be in school teaching their students. SHAPIRO: The largest districts in the state have said they're going to close on Wednesday because so many teachers planned to call in a personal day. Do you think the majority of those teachers are insincere in their complaints about the school conditions and are just kind of being used for partisan political ends as you suggest? MOORE: I believe that teachers have legitimate concerns. And the thing is we've addressed very many of those. SHAPIRO: We ran the numbers he quoted by the NEA, the National Education Association. They told us the growth figures don't account for inflation. Factor that in and the NEA says North Carolina teacher salaries have fallen by nearly 10 percent in the last decade. Tomorrow won't be the start of a multi-day strike like the ones in West Virginia and Arizona. But Michael Maher says the central questions are the same in each of the states. Maher is assistant dean at the North Carolina State University College of Education. MICHAEL MAHER: It comes down to priorities - right? - how we want to invest in education going forward. What do we really want to invest in in this state? How can we make the best possible decisions? And I think that is also one of these things that's getting lost in kind of the back and forth is that this isn't only about teachers, right? It's about kids. SHAPIRO: Teachers say tomorrow's protest to North Carolina is meant to send a message. If these lawmakers don't meet their demands, voters will choose new ones in November who will. Transcript provided by NPR, Copyright NPR.